I have the good fortune of traveling to a myriad of remarkable places in the world. And, India certainly has its share of remarkable places and cultures!. I have been to Nagaland in the far northeast, near the Myanmar border, a number of times. 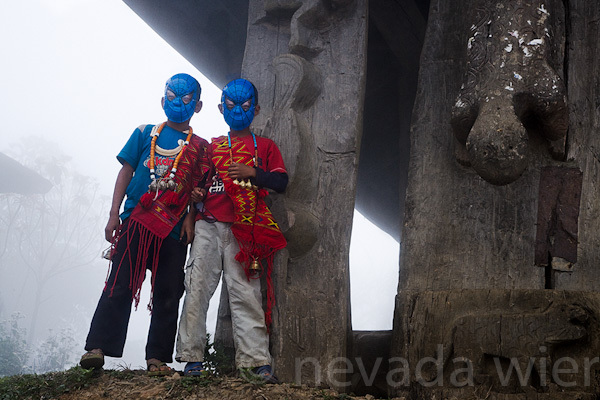 In 2008 I visited the northern area of the Mon Nagas during their festival period. In addition to visiting the communal tribal festival gathering in town of Mon, of course, I traveled to the villages. At Wakching I spied two boys in their traditional festival garb wearing Spiderman masks. 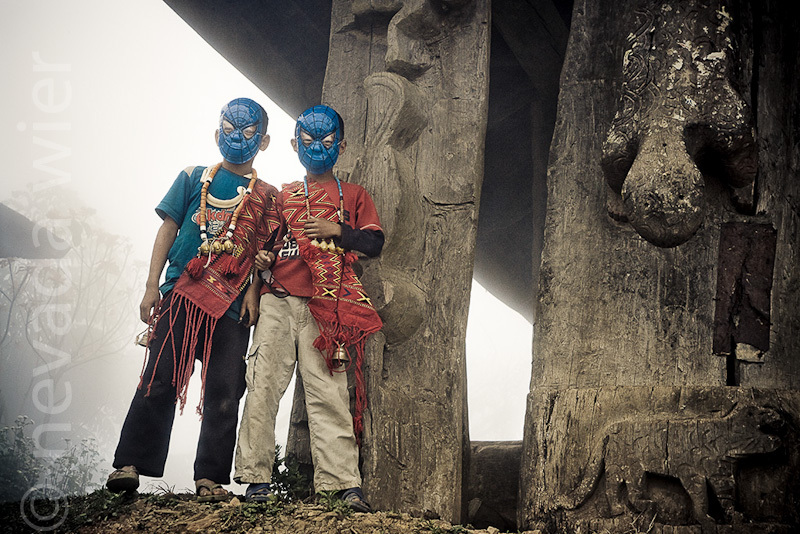 I beckoned to them to stand up near the traditional Naga murong (meeting place for the men of the tribe) that is decorated with carved wooden creatures. I always ask myself before clicking the shutter. “What is the problem?” There is always a problem that might require removing a piece of trash, or adjusting my position to eliminate a disruptive element in the background, or … oh there are so many possibilities. In this case, the light was even because of a subtle fog but that meant the sky was bright white. Since the eye is attracted to the lightest thing in an image it was important to incorporate the white sky as an effective design element. I motioned for the two boys to move slightly over so that the left most boy was fully in the white sky helping to tone down its predominance. I wanted the right boy to maintain a presence in the murong so that they were bodily connected. I was acutely aware of the pattern that the wood and sky were creating. It was clear to me that the composition had to be impeccable. Obviously the boy’s facial expressions were not important, it was their total body language that had to convey impact. I noted that their legs were separated and arm positions were natural. They were definitely confident and willing to be photographed. But one always has to work fast with young boys; they can bolt at any moment! So all of this happened very quickly in my mind. But it had to right in the frame because I do not crop or change any content in my images! This photograph became part of an exhibit/book work-in-progress called Outer India. I had a showing of its first phrase at the Verve Gallery in Santa Fe NM in 2010 (I have another show coming up at the Zia Gallery in Chicago this coming September 7 – October 13, 2012.) I decided when I began printing for the show that some of the Northeast images would be selectively de-saturated. This is a gritty, tribal area and a more muted look suited the area. I did a mockup in Lightroom as a guideline then started from scratch in Photoshop—layer by adjustment layer (sometimes over 40 layers), to sculpt the image. It was a painstaking process but I am very pleased with the prints for the series. And, I especially love this one. Printed in my studio with the HP Z3200 printer on Hahnemuhle Photo Rag Baryta paper. Here’s the color image with a minimal of work in Lightroom. Thanks for showing the pictud in the world.. I was wondering how you handle photo releases in a situation like this.. Do you have to find the parents? What about the language barrier? Matthew: If I have a translator with me who can explain the release then I try and get one. However, you are correct, they are minors so the parents need to sign it. And, they were not around, so I don’t have a release for this particular image. I bring an ink pad with me to get a thumbprint if someone is not literate. Your way of approaching images as “puzzles to solve” BEFORE clicking the shutter is rubbing off on me. Yay! Love the Anatomies. More, please. I love the Anatomy of a photograph series– this image is particularly beautiful. here, or what is going wrong here?” I can’t always solve it, but I try. Another beautiful image. I like hearing your thought process, and I must say, the processing is wonderful. Although you may have 40 layers, it looks very natural. Once again you prove you are the best living photographer on the Planet. A beautiful photograph. Love that diagonal separating light from dark. Fascinating to hear your thoughts on setting up this shot. Thanks for the inspiration. Wonderful image. Thank you for sharing the story behind it. Nevada – It could be lack of experience or a narrow mind but I have a hard time even comprehending 40 layers! Is there somewhere I can see your photoshop techniques in action say an online tutorial or something? I love the phrase “sculpt the image” and I aspire to that level of vision and detail but relatively speaking it sounds like I’m just banging on my images with a lightroom sledgehammer! Beautiful Image Nevada. Thank you for explaining 40 layers. 40 layers made my head pop a little as well. I use LR because it is so easy and powerful/efficient. I just don’t have the time right now to become effective in PS. (I also sometimes think I’m “lightrooming” my images to death and so I try to be subtle with my changes when possible.) The ‘burning and dodging’ reference you use gives me a lot of insight into what you mean. 40 layers makes sense if one thinks of it like the steps involved in going around an image in the dark room manipulating different areas and ‘sculpting’ the way the paper/image is exposed in steps. Makes a lot of sense when you put it that way. Thanks! As I replied to Candance, creating an print is a different beast than processing an image for email, presentations, or web. Most of my images end at Lightroom Processing (especially now that that LR4 Develop module is more efficient and effective). However, sculpting a fine-art print is another situation that requires managing in Photoshop! It’s a beautiful image Nevada. The balance of detail and light & dark is perfect. Thanks for sharing! « I’m in the Adobe Lightroom 4 Promo…how cool is that!